Peter Leahy had a lot to say about the situation which saw 12 players leave his Mayo ladies football squad on 'welfare' grounds last year and he had no interest in holding back. "Day one for a new Mayo" starts on Sunday against Tipperary in Division 1 of the Lidl Ladies Football League but it's hard not to first go back on old ground and the reasons why there are only four players from their 2017 All-Ireland final team available for selection this season. 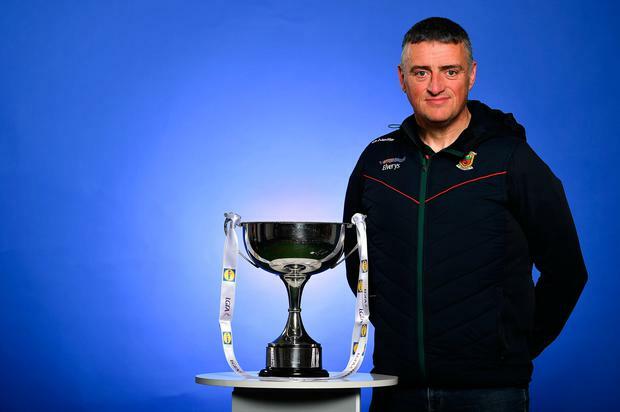 Mayo legend Cora Staunton was part of a high-profile cohort which left his panel in the wake of their league final defeat to Dublin and, with no Carnacon contingent on board for 2019, Leahy insists the county is "wounded". "People are wounded. There's girls who are playing with us now who are wounded, there's girls who have left who are wounded. There's myself who got wounded out of it. But it's a sport, there was no substance to anything that went on," Leahy said. "That's been proven over and over again. There's been a lot of pride hurt, I understand that. When people make a play and it doesn't work, it's time for people to stand up and be counted. "If you want to play for your county, come and play for your county. That's my attitude to it and I'm only a bainisteoir for whatever amount of time and Mayo is Mayo for life. If you want to play for Mayo, you should come and play for Mayo." Leahy has a "major issue" with the fact that gender was wrongly brought into the narrative of the story with the 'sensitive' issues at the centre of the storm "happening in every single dressing room in the country". He believes the WGPA - which represents players - were wrong to release a statement without the blessing of the remaining Mayo players and feels the players who departed his squad were unable to deal with Leahy taking decision-making out of their hands. "We had issues with some people who weren't going to get to play, or weren't starting. They are the people who had problems. "It shouldn't be about 'unless I have one to 15, I'm not going to have a part, it's my ball and I'm going to run away with it'." While unhappy with how the LGFA dealt with the whole affair, the Westmeath native carried his head high as "innuendos were being thrown out there, but there was nothing said or done to say that I had done anything wrong". Leahy outlined numerous calls from other ladies football managers supporting his stance on the matter and hanging in there under intense pressure and he never thought of packing it in, it's not in his nature. "One thing I will always do, I will never step away from intimidation, I will not step away from any type of bullying, I wouldn't expect any of my players to do it and I won't do it either. If I'd done anything wrong I'd have to leave, I'd run for the hills. "I've nothing to hide. I went in to try and manage a team that had a few players that believed that they should be leading the team but that's a very difficult position no matter what you do. "There's very little happy endings to that but I didn't isolate any players, I didn't do anything different to any other players." He feels players made a "mistake" to go public with their grievances and suggesting "innuendos" which allowed rumours to run wild but "the door is 100pc open" for a return, although "not for this year now". "We have players who wouldn't come in because of senior players being established and not getting opportunities. Now they are coming in," he said before he added of the players which left the fold: "Peter Leahy is not stopping them. I didn't ask them to leave. I wasn't stopping them playing. "They are stopping themselves playing, so if they don't want to play for Mayo, then they shouldn't be playing for Mayo. "You have to want to pay for Mayo. If you want to play for Mayo, no manager should stop you, and I won't stop anyone playing. They won't be treated any different coming in. There is nothing would change. Not one single thing would change. "I worked under managers and with managers that I didn't like but you get on with it. You do it for the team. That's basically what I'm looking for."